Cristian Guzman grounds out, first baseman Ryan Howard to pitcher Nelson Figueroa. Alberto Gonzalez to 3rd. Cristian Guzman doubles (1) on a line drive to right fielder Jayson Werth. March 28, 2012 Cleveland Indians released 2B Cristian Guzman. February 22, 2012 Cleveland Indians signed free agent 2B Cristian Guzman to a minor league contract and invited him to spring training. November 7, 2010 2B Cristian Guzman elected free agency. November 2, 2010 Texas Rangers activated 2B Cristian Guzman. October 4, 2010 Texas Rangers reassigned 2B Cristian Guzman to the minor leagues. September 1, 2010 Texas Rangers activated 2B Cristian Guzman from the 15-day disabled list. August 31, 2010 Frisco RoughRiders sent SS Cristian Guzman on a rehab assignment to Oklahoma City RedHawks. August 27, 2010 sent SS Cristian Guzman on a rehab assignment to Frisco RoughRiders. August 14, 2010 Texas Rangers placed 2B Cristian Guzman on the 15-day disabled list. Right quadriceps strain. 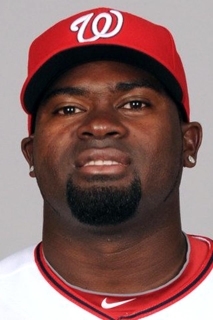 July 31, 2010 Washington Nationals Traded 2B Cristian Guzman to Texas Rangers and Frisco RoughRiders Traded RHP Ryan Tatusko and RHP Tanner Roark to Harrisburg Senators. October 16, 2009 SS Cristian Guzman assigned to Tigres del Licey. April 29, 2009 Cristian Guzman roster status changed by Washington Nationals.